ASK MOST TOURISTS in Turkey where they’re headed, and they’ll likely say a resort somewhere on the Marmara, Aegean, Mediterranean, or Black Seas. The country has 5,177 miles of coastline, and its beaches are without question some of the finest in the world. But Turkey is also home to mountains, lakes, and geological splendors that rival any setting of sun and sand. Here’s a breakdown of the country’s different landscapes and the stunning natural areas they contain — so when someone asks you where you’re headed, you’ll raise a few eyebrows. Cappadocia is easily Turkey’s best-known natural beauty. The huge, conical “fairy chimneys” — formed as erosion slowly carves the soft, porous volcanic stone — give anyone in their presence the illusion of being on another planet. Not wanting to disrupt the natural beauty of the area, the locals have been carving their homes into this mysterious rock for centuries. The truly dedicated start their trip at dawn with a hot-air balloon ride over the massive formations, almost always followed by a glass of celebratory champagne. If you prefer to keep your feet firmly on the ground, wander the valleys on foot — there are plenty of easy hikes — or bike through the villages. Though, perhaps the most appropriate way to explore is on horseback, since some believe that “Cappadocia” means “land of the beautiful horses” in ancient Persian. The hotels in the region are mostly “cave hotels,” with rooms hewn into the porous volcanic rock. Many operate in converted houses dating back centuries, with some even featuring subterranean chapels. The area has a strong Christian history, and a number of underground churches with unexpectedly colorful, frescoed walls are open to the public. What’s more, this terroir has produced excellent wines for millennia, so definitely indulge before you leave. 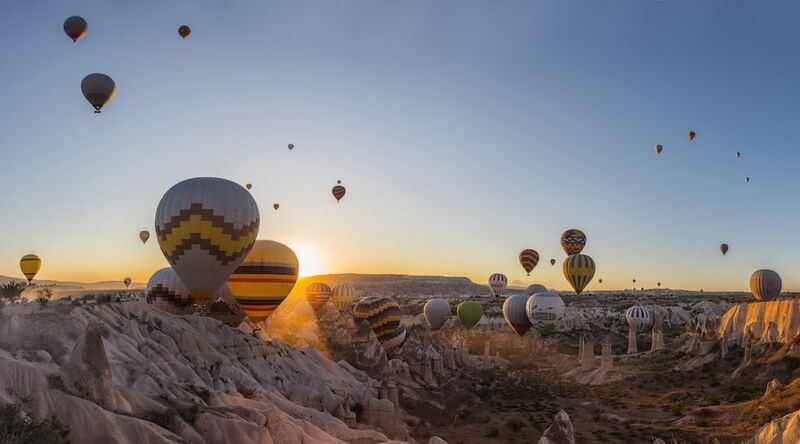 What you should know: The closest airport is in Nevşehir, about a 30-minute drive away, but there are more frequent flights to Kayseri, an hour away. 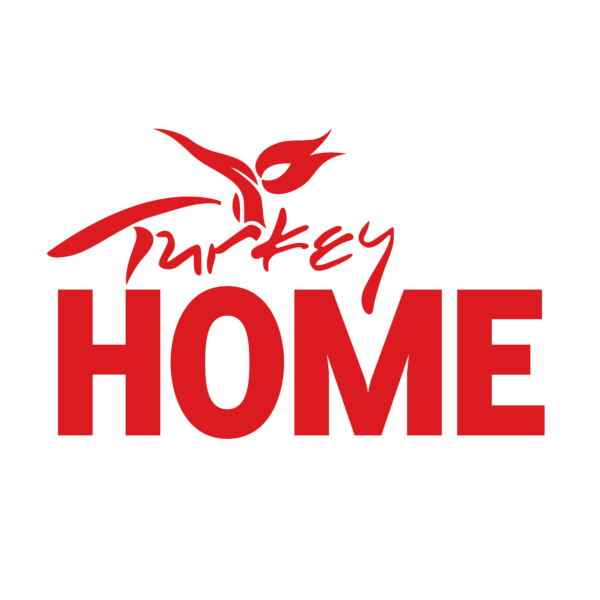 Most of the hotels are in the town of Göreme, and your hotel or travel agent can book a tour for you. The best time of year to visit is spring, when a layer of flowers carpets the floor and the annual Cappadox festival is held (think outdoor music, art, and food). Summer is the busiest season — and the hottest. Located halfway between the popular resort cities of Marmaris and Fethiye on the Mediterranean, Dalyan is a more under-the-radar spot that goes beyond the summer triumvirate of sun, sea, and sand (though it has that in plastic bucket-loads, too). The main draw here is İztuzu, a three-mile-long sandy beach that has the rare privilege of being a nesting ground for loggerhead sea turtles, known in Turkey as caretta caretta. Turtle Beach, as it’s also referred to, is carefully patrolled and protected during breeding season, but lucky swimmers might see a hatchling braving the waters. 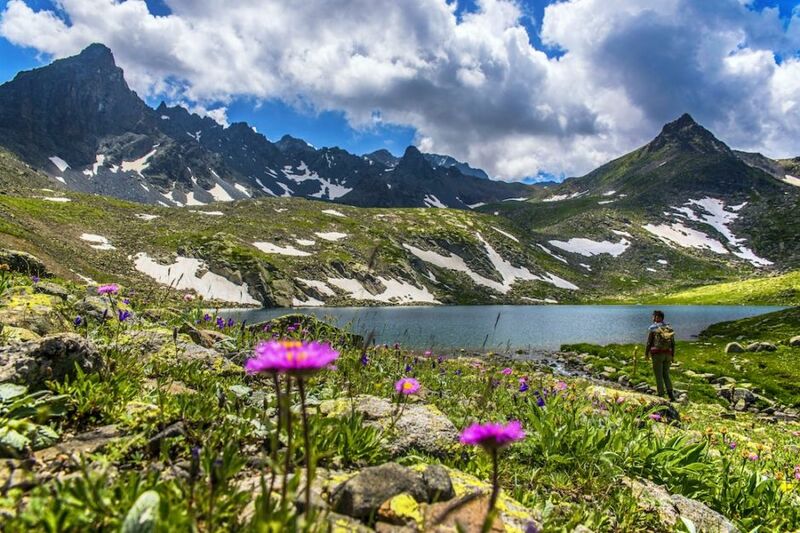 Slightly inland is the freshwater lake of Köyceğiz, which has hot springs (thought by the ancients to confer eternal health), mud baths, and hiking trails. Consider taking a slow boat ride on the stream that connects the lake to the sea — it’s where Nile turtles swim, and you’ll be surrounded by head-high reeds. Along the shore is the ruined city of Kaunos, which adds to the scenery. The entire region features romantic Lycian cliff tombs that almost feel as if they’re looking down at you. After dinner — the local specialty is blue crab — some hotels will provide you with a rowboat to float under the melancholy gaze of the illuminated tombs. What you should know: The closest airport is Dalaman, only 30 minutes away. 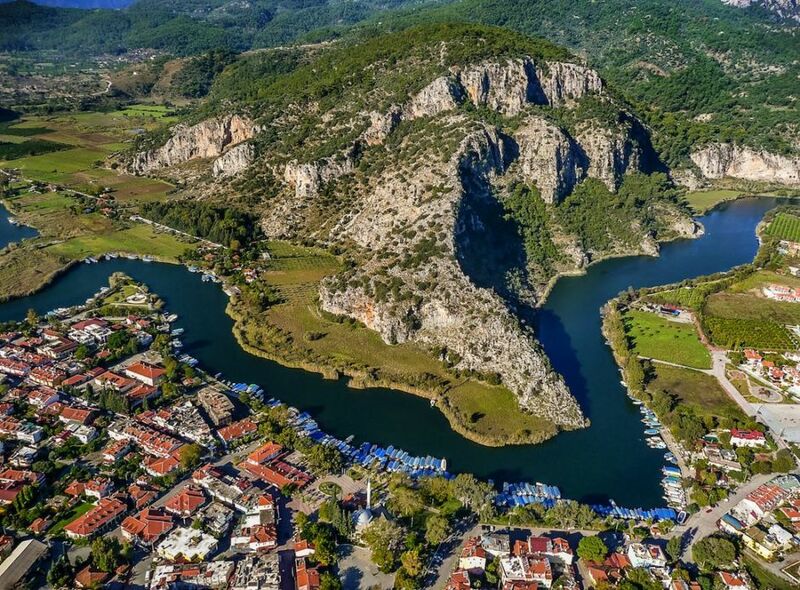 Dalyan has many small boutique hotels, but you can also stay in one of the larger five-star resort properties in Dalaman. 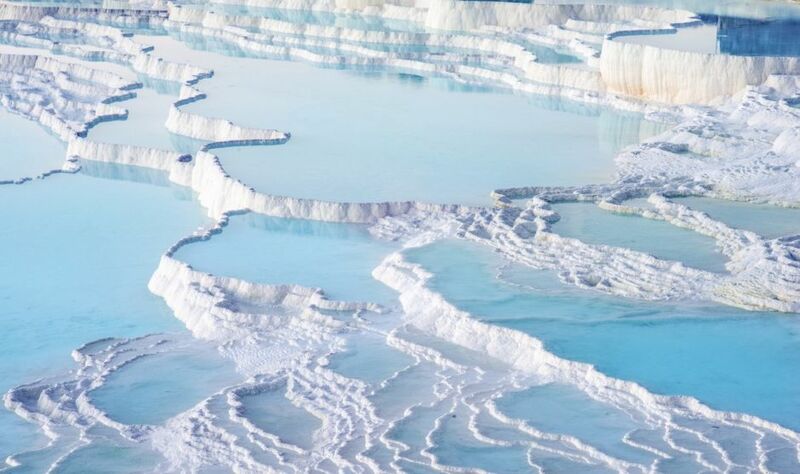 The healing waters and white terraces of Pamukkale — “cotton castle” in Turkish — attracted the first tourists to Anatolia way back in the 2nd century BC, when the city of Hierapolis was founded here. The ancient Greek philosopher Strabon was among the earliest, and he wrote that “the waters calcify so quickly that people divert streams into channels around their homes to build solid fences.” Hierapolis was also home to many temples, making it a center of worship, too. The ruins — a UNESCO World Heritage Site — can still be visited today (the theatre is particularly well preserved). While they’re totally worth a stop, it’s the thermal pools and travertine terraces that are the real draw. Mineral-rich and 95° Fahrenheit, the waters are said to heal a number of sicknesses. You can soak in the pools and use the chalky clay at the bottom like a loofah, even if your ailments don’t actually wash away. What you should know: The closest airport is Denizli-Çardak (about an hour away), and there are frequent flights from Istanbul. Bring something to carry your shoes in, as you’re only allowed to walk barefoot in the pools. If you prefer not to bathe outside, many of the hotels in the region also have pools that pump in the thermal spring water. Leave time to visit the Pamukkale Hierapolis Archaeological Museum to see millennia-old works from Hierapolis, and try to make a side trip to Aphrodisias, about 1.5 hours away — it’s one of the most stunning of the ancient cities in Turkey and recently achieved UNESCO status. If you’re looking for a vacation where the loudest sound you’ll hear is a cowbell, head to the Kaçkar Mountains. They’re Turkey’s longest and highest range, peaking at an elevation of about 13,000 feet. Stretching from the western border of the Artvin province to Georgia and the Black Sea, the mountains are covered with ancient sub-tropical rainforest. Kaçkar Mountains National Park is a particularly beautiful section of this already stunning area, not far from Rize. The forests are filled with wildlife — almost every bird of prey can be found here, as well as otters, goats, lynxes, and wildcats. Birdwatchers should head to Fırtına Vadisi (“Valley of Storms”) in Çamlıhemşin, said to be one of the top 100 bird sanctuaries in the world. Besides nature gazing, you can hike the steep hills around mountain lakes, and go rafting, ziplining, or heli-skiing on the vertical, snow-covered drops. The cool plateau pastures (yayla in Turkish) are where locals escape the heat of summer and graze their cows; if you’re up for it, plan a meal in a traditional village home not far from your day’s adventure. Keep in mind that the Black Sea region is the center of Turkey’s tea trade, so make sure to try a glass (you’re bound to be offered one) when you’re in this area. What you should know: The closest airport is in Trabzon, but the access point to the mountains is the town of Ayder, about two hours away. It’s best to book a guide for your trek, as it’s easy to get lost on the trails. You can definitely camp here, but there are also rustic, Appalachian-esque cabins with cozy fireplaces available for rent. But because this is the true Turkish wilderness, know that you probably won’t have cell phone reception, cozy fireplace or not. Be prepared for it to be just you and the world wherever you wander.